Who wants to eat the most delicious, nutritious healthy brownies in all the land? YOU DO? Oh good, I’m glad you’re here. Welcome to Day #3 of #AKZucchiniWeek 2018. SAY WUD UP to my healthy zucchini brownies aka the BEST zucchini brownies out there. This recipe officially goes in my ‘best of’ series! You know me, always trying to experiment with baked goods to make them both nourishing, wholesome and delicious enough for you jump on a couch like good old Tommy Cruise (please reference this link). This recipe just be one of my favorites of the entire week because these are SIMPLY INCREDIBLE. 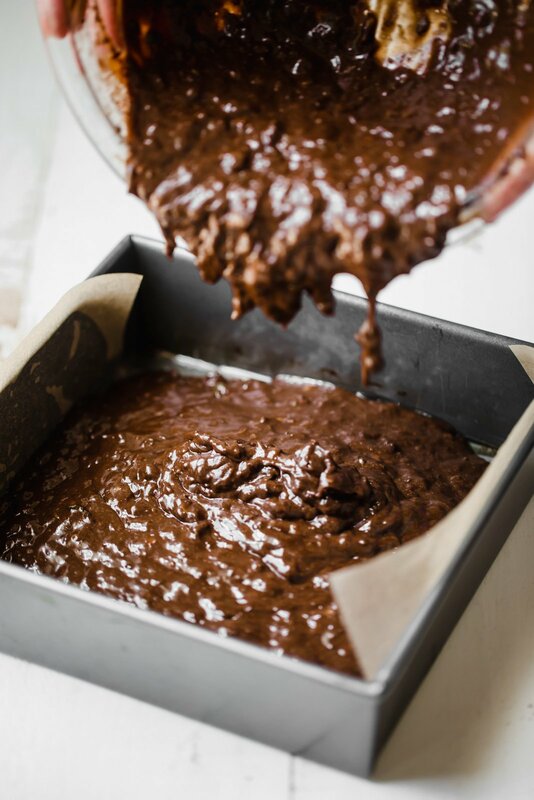 Fudgy, packed with chocolate, naturally sweetened, full of zucchini and guaranteed to get you hooked. Zucchini. I mean it is zucchini week. So we’re putting zucchini in our brownies. TRUST ME. Tahini. You know, my latest obsession in life. If you aren’t into tahini yet, I’m here to convince you. I especially love it paired with chocolate since it happens to be just slightly bitter and earthly. It compliments these brownies very well. Here’s my favorite brand. Pure maple syrup. I adore pure maple syrup in baked goods because the flavor isn’t as noticeable as honey. It provides nourishing vitamins and it’s from the trees. What more could you want in an all natural sweetener?! Coconut sugar: The caramel-like flavor that comes from coconut sugar helps to make the flavor of these brownies outstanding. Similar to maple syrup, it’s an all natural sweetener! And yes, this recipe requires that you use both. Coconut flour. You only need a little (2 tablespoons) but it will go a long way to keep these brownies the perfect fudgy texture. Cacao powder: I’ve started to use cacao powder instead of cocoa powder in my recipes because it’s less processed but tastes exactly like cocoa powder. Each serving of cacao powder provides 25% of your daily magnesium, 10% iron and 18% fiber. This is the brand that I typically buy. 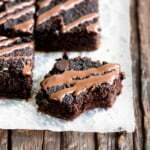 Chocolate Chips: I love using chocolate chips in these brownies. If you want to keep these dairy free, be sure to use dairy free chocolate chips (such as the Enjoy Life brand). Alright enough talking, it’s time to bake these bad boys up. Pro tip: Put them in the fridge for a delicious cold SUPER fudgy brownie! ENJOY! 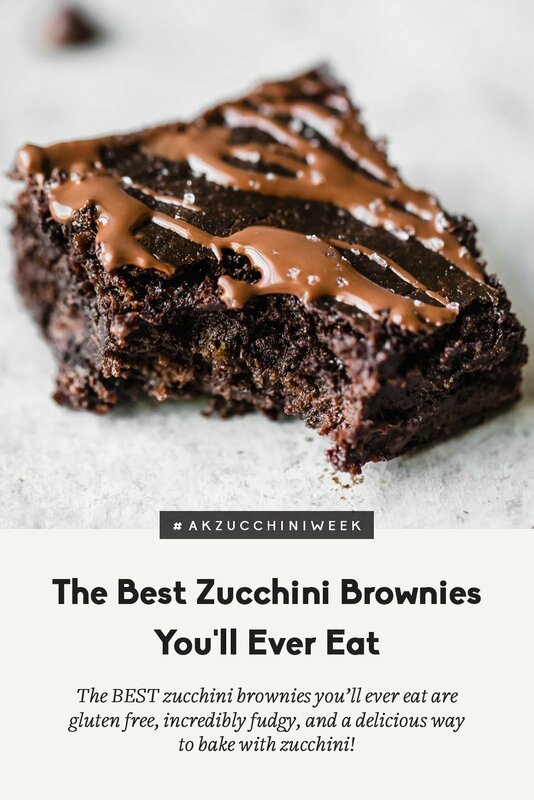 If you make these zucchini brownies, don’t forget to leave a comment and rate the recipe below. And of course, if you have Instagram, we’d love to see your creations — don’t forget to tag #ambitiouskitchen! You can also join our AK Facebook community group here. The BEST healthy zucchini brownies you'll ever eat are gluten free, paleo, deliciously fudgy, and the perfect way to bake with zucchini. Top them with fancy sea salt to make them extra special! Preheat oven to 350 degrees F. Line an 8x8 inch pan with parchment paper and spray with nonstick cooking spray. In a large bowl, add your shredded zucchini, making sure it is squeezed of all excess moisture with a paper towel. This is very important. SQUEEZE IT AND GET ALL THAT WATER OUT! Next add in egg, tahini, maple syrup, coconut sugar and vanilla; stir until smooth. Gently stir in cocoa powder into the batter, mixing until well incorporated. Next add in coconut flour, baking soda, salt and finally the melted coconut oil. Stir until well combined. Fold in chocolate chips (and walnuts if you are using). Pour into prepared pan. Bake for 30-35 minutes or until toothpick inserted into center comes out with just a few crumbs attached (it should not be completely wet, but a little gooeyness is just fine). Allow to cool completely. This will be tough, but it’s the best way to make sure the bars stay together perfectly since they will be moist. Once ready for the chocolate drizzle: Add 2 tablespoons chocolate chips and coconut oil to a small microwave safe bowl. Microwave in 30 second increments, stirring inbetween, until chocolate is melted. 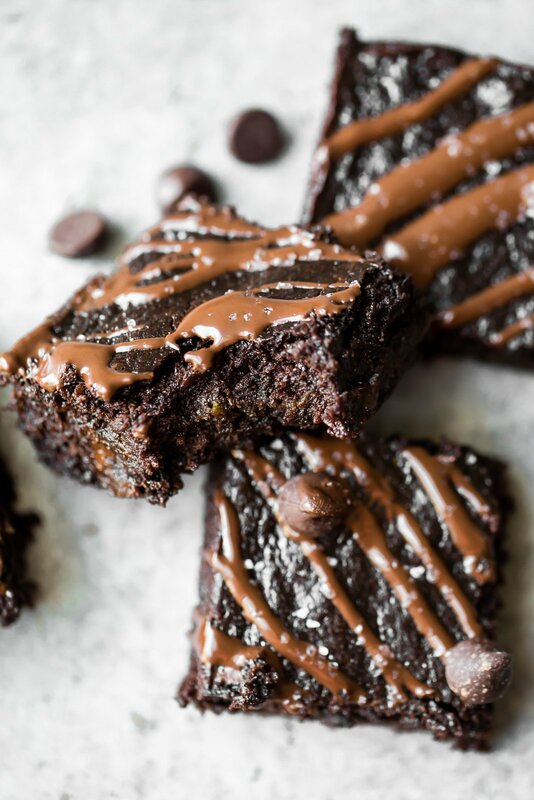 Drizzle over zucchini brownies. Sprinkle with a little fancy sea salt (trust me, it’s good!). Cut into 16 squares. *To sub tahini: Instead of tahini, feel free to use almond butter, sunflower seed butter or cashew butter. I would not recommend peanut butter because it throws off the flavor. Tahini is best though and I have only tested the recipe using tahini. To make it vegan: I recommend using 1 flax egg (1 tablespoon flaxseed meal mixed with 3 tablespoons water). Let it sit in fridge for 5 minutes before using in recipe. 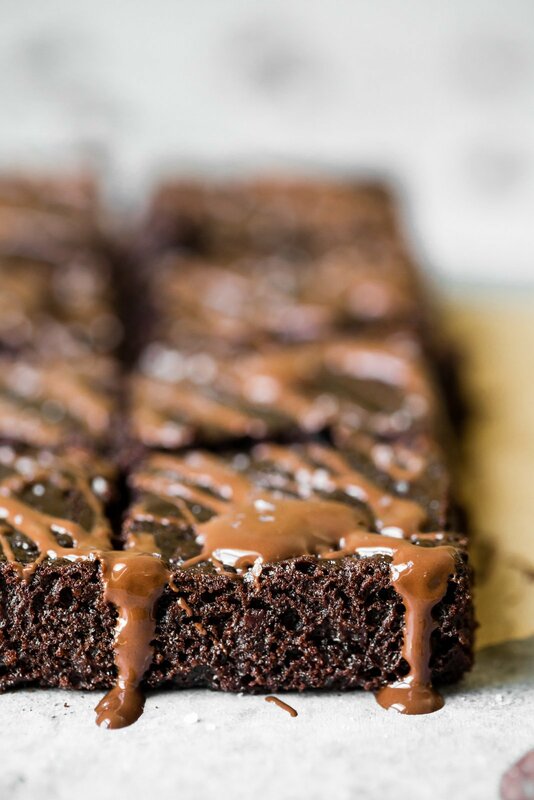 84 Responses to "The Best Zucchini Brownies You’ll Ever Eat"
These look INSANE! Now I can’t decide if I want to make these or the muffins you posted Monday! Ahh I have family visiting me from California this weekend so I want to spoil them with some baked goodies! They’re seriously sooo good!! I’d suggest muffins AND these 🙂 Bob’s paleo flour should work in here, too. Enjoy! Mouthwatering! I will be making these this weekend for sure! WUD UP! I love zucchini baked everything so these are at the top of my baking day bucket list! The brownies are very soft and sweet. The flavor of chocolate quickly dissolved in the mouth. That’s so great when seeing your recipe. OMG! I love your hidden veggie sweet treats! Definitely saving all of them! 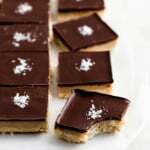 Could you use granulated maple sugar in place of the coconut sugar? Coupla questions: should I measure the grated zucchini and then squeeze the water out OR squeeze the water out THEN measure? It seems there would be more post -squeeze. Also, yellow zucchini/summer squash would probably work equally well, do you think? 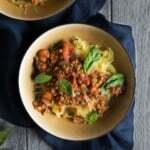 I just LOVE zucchini and these recipes are so wonderful! Sometimes (well, lots of times) you check them in the garden and they are tiny and in 2 days are toddler-sized. Hi Gerise! You should grate the zucchini, squeeze it out of excess moisture, and then measure out 1 cup (no need to “pack it” into the cup). Sorry, I’m taking that the zucchini doesn’t need to be cooked..correct? Hi Jenny! Great questions. You should grate the zucchini, squeeze it out of excess moisture, and then measure out 1 cup (no need to “pack it” into the cup). I haven’t tried using yellow squash – it tends to have less moisture, but let me know if you do try it! So glad you love them Stephanie!! The sneaky zucchini is the best 🙂 Enjoy! Just made these tonight and they were delicious! I love making healthier treats that my girls (6 year old twins) love. You would never know there were hidden veggies. I swapped the coconut oil with avocado oil. So good!! These look delish! I am going to try with almond flour as my little one is allergic to sesame. However, my nut butters are usually quite stiff and wouldn’t stir smoothly together with the other ingredients. Any tips? Thank you! 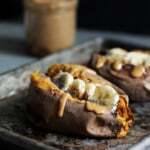 Almond butter or cashew butter will work well in here! I’d look for an all-natural one that is nice and smooth so that it combines well with the other ingredients 🙂 Enjoy! 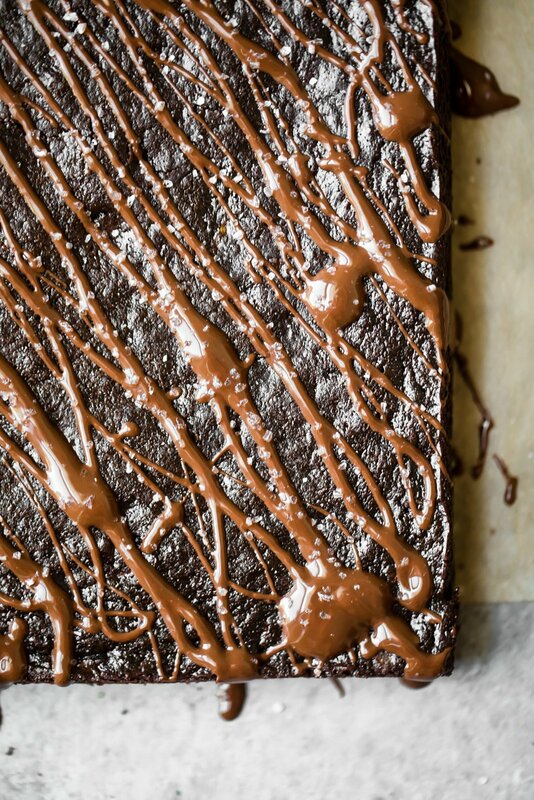 The BEST zucchini brownies ever? OMG! 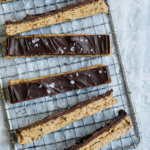 These look absolutely magnificent and I am delighted that there is a vegan-friendly alternative! 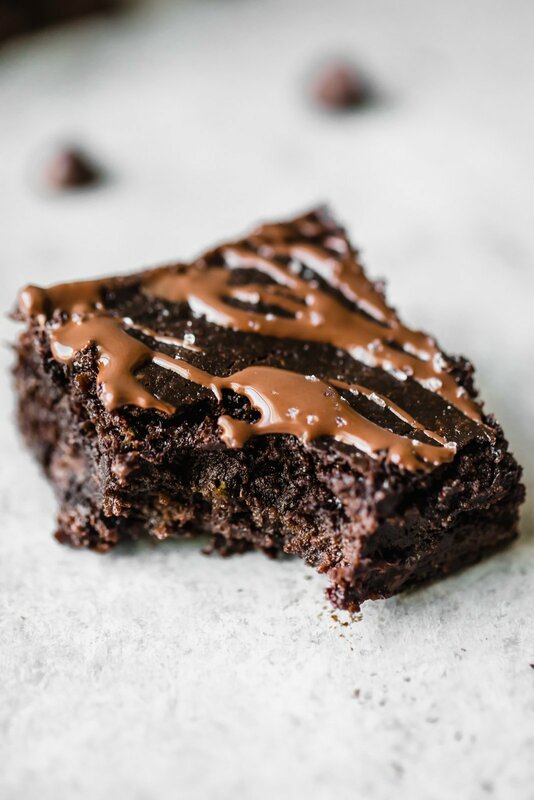 I will definitely get my brownie game on soon and try baking these! These look amazing. Can I substitute honey or coconut nectar for maple syrup? I just made these, and the entire family gobbled it up. My husband said, “these are insanely good, what’s in it? ?” He couldn’t believe there was zucchini it in. I did make some modifications to go with what I had in my pantry: used almond butter instead of tahini, melted butter/applesauce combo instead of coconut oil, used cacao powder, regular flour (also increased to 3 1/2 tablespoons), added 1 table spoon chia seeds (gave it a nice crunch) and topped with pink sea salt once cool. These were so moist, fudgy and out of this world. Will def be making them again!! Thank you!! The sneaky vegetables are the best! Glad you guys loved these ones, and that those modifications worked out for you. Is the coconut sugar in granulated or liquid form? Would date syrup be a good substitute to it? Thanks and can’t wait to make them! Hi! It’s granulated, so date syrup might change the consistency a bit in these. So happy to hear that! The perfect treat. These are so good! I’ve made them twice. Keeping them in the fridge is on point!!! YES love them straight from the fridge! Hi! Is it possible to sub the coconut sugar for something else granulated? These are so GOOD! I did not make the glaze and used 1/4 cup maple sugar and 1/4 cup organic brown sugar and added 1/2 tsp. espresso powder. Really awesome! And it makes a small pan so you can’t get in too much trouble 😉 ! For the Tahini which flavor are you using? There are two showen in the link you provided. Hi! I used the regular flavor of tahini in this recipe. Made these to bring to a dinner party and they were a HIT. They were super fudgy and soft, kind of reminiscent of lava cake which paired well with vanilla ice cream. A sprinkle of salt with the drizzle was really key, and brought out the rich chocolate flavor. I was worried the tahini would make them taste a little too earthy/bitter and give away that they were “healthier” but all the flavors just came together amazingly! These aren’t just the best zucchini brownies, they’re the best brownies I have ever had! My daughter and I have made these twice and they are such a hit with the entire family. Thanks for a great recipe! These are absolutely amazing! My kids love them. Your recipes are fabulous . Thank you! These are INSANE!! May or may not have eaten half of the pan in one sitting. 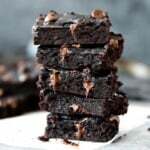 This is my new go-to brownie recipe! These are INSANE!! May or may not have eaten half of the pan in one sitting. Just made these today since my twelve year old asked me to make a dessert AND he refuses to eat vegetables. I served him a brownie and said “these are vegetables!” We all loved them. I think I loved them a little too much, but they are oh, so good. Will definitely make them again. This was my first time using coconut sugar and flour. I made my own tahini from organic hulled sesame seeds before I started with the brownie recipe. Amazing! So happy to hear that, Cindi. Love that you make your own tahini, too! Can any other flour be subbed for the coconut flour? Oh no! Hope you get a chance to bake them up soon! Another TO DIE for recipe. I’m becoming more and more obsessed with your blog ;). I didn’t have coconut flour so I used quick oats instead (without even blending them). And pecans instead of walnuts. The result was a combo of fudge and brownie. The most moist, addicting brownie I have ever tasted THANK YOU so much for what you do! Do you recommend anything I could supplement for eggs? I’m sadly sensitive to them and NEED to try these, lol. 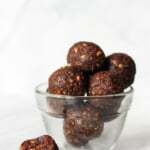 Yes you can use flax eggs! Check the notes section of the recipe.